I only interacted briefly with a member of the staff when I asked for the cabin details to be re-sent. I received a response promptly and the person who responded was very helpful. The staff was excellent and always willing to help. We loved the stay here and we survived the early March Blizzard! In Comfort. Loved the views from the porch. The peace and quiet was great. We shall return. We were here for our honeymoon. This cabin was absolutely beautiful. We will definitely return. We did so much while we were here. Thank you for everything. Thank you so much! We had a wonderful time at Wolf Ridge Cabin. Perfect place for a honeymoon. We highly recommend going hiking around the cabin and visiting Bryson City while you're here. We loved this cabin. Can't wait to come back. As always, the team was excellent to work with. THank you for a wonderful stay in your lovely cabin! We enjoyed fly fishing at Deep Creek, hiking and beautiful fall color. 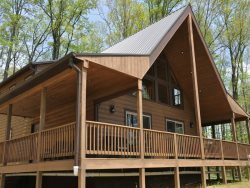 Your cabin was so quiet and peaceful and we loved every minute spent here! Thank you again and we will return very soon. Your team was very helpful and knowledgeable. Plenty of info was given to us well in advance. They made it very easy to reserve a cabin. And the 10% military discount is a great bonus! We decided on this place for our honeymoon and don't think we could have chosen a better place. Everything was perfect! We had a wonderful stay! Beautiful view and close to lots of fun activities. Everything was great. We took our daughter on the Polar Express in Bryson City - truly a magical experience. First time in the Smoky Mountains. Nice views, beautiful cabin and very clean. Lots of things to do and see. We will come back to see the fall foliage next time. Thanks so much for renting for your special place. We had a relaxing and enjoyable time. This whole area is beautiful. This rental was perfect for everything we wanted to do. We have enjoyed this cabin and the views. The deer came in the mornings making a great start to the morning, The peace and quiet are priceless here if your are from the big city in Florida. Thank you for renting this cabin to us. Everything is welll taken care of and clean. Everything was done online. Process is very efficient. Had a great time. The cabin was very clean and nice. We love the smokies.